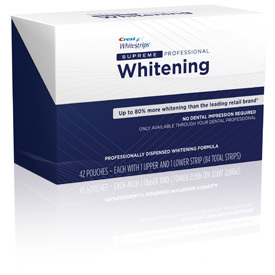 Whitestrips Supreme Professional Dental Whitening System. Crest Whitestrips Supreme Professional Dental Whitening System. 14% longer upper strips and 18% longer lower strips - whitens up to 18 teeth. Crest Whitestrips Supreme - 43% better whitening than Professional Whitestrips.